While it's certainly possible to purchase Apple products and services online, it's often the interactive shopping experience Apple retail stores provide that consumers crave. So, a very frequently asked question from shoppers around the world is, "Where are brick-and-mortar Apple Stores located?" As of 2018, Apple Inc. was operating 506 retail stores in 25 different countries around the world, including the U.S., where it has retail stores in 44 out of the 50 states, plus the District of Columbia. Slightly over half of them (272) are in the U.S. The first two Apple brick-and-mortar retail stores opened simultaneously in McLean, Va., and Glendale, Calif., in 2001. The first international Apple Computer retail store opened in the Ginza district of Tokyo, Japan, in 2003. The complete list of countries that have at least one active Apple owned and operated brick-and-mortar retail store as of December 2018 is below. The list is arranged alphabetically by nation. Australia Apple Stores are located in all the major cities, including Canberra, Adelaide, Perth, Brisbane, and Sydney. Austria's sole Apple Store is in Vienna. Belgium has just one Apple Store, located in Brussels. Brazil Apple Stores are located in Rio de Janeiro and Sao Paulo. Canada Apple Stores are located in the provinces of Quebec, Ontario, Nova Scotia, Manitoba, British Columbia, and Alberta. China Apple Stores are located throughout the country and in major cities, including Shanghai, Beijing, and Nanjing. One of the company's newest is in Suzhou. France Apple Stores are located in Bordeaux, Dijon, Lyon, Nice. There are three in Paris, including a new flagship on the Champs-Élysées. Germany Apple Stores are located in Berlin, Dusseldorf, Frankfurt, Hamburg, Cologne, Munich, etc. Hong Kong Apple Stores are located in Tsim Sha Tsui, Causeway Bay, Kowloon Tong, and Central. Italy Apple Stores are located in Bologna, Firenze, Rome, Torino, and, as of this year, Milan. Japan Apple Stores are located in Osaka, Miyagi, Tokyo, Fukuoka, etc. One of the company's newest is in Suzhou. Macao's two Apple Stores are both in Cotai shopping centers. Mexico has one Apple Store. Netherlands Apple Stores are located in Amsterdam, Den Haag, and Haarlem. South Korea's sole Apple Store is in Seoul. Singapore has one Apple Store. Spain Apple Stores are located in Madrid, Barcelona, Malaga, Valencia, etc. Sweden Apple Stores are located in Helsingborg, Malmö, and Täby. Switzerland Apple Stores are located in Basel, Geneva, Glattzentrum bei Wallisellen, and Zurich. Taiwan's sole Apple Store is in Taipei. Thailand is home to one of Apple's new 2018 stores, in Bangkok. Turkey's two Apple Stores are located in Istanbul. United Arab Emirates Apple Stores are located in Abu Dhabi and Dubai. United Kingdom Apple Stores are located in Aberdeen, Bath, Belfast, Birmingham, Brighton, Bristol, Cambridge, Cardiff, Edinburg, Glasgow, Kingston, Leeds, Manchester, Newcastle, Sheffield, Southampton. United States Apple Stores are located in every state except for Montana, North Dakota, South Dakota, West Virginia, and Wyoming. According to The Wall Street Journal, Apple Stores are now one of the most valuable "anchor" stores a retail shopping mall can have. Malls consistently report a 10 percent increase in sales after an Apple Store becomes part of the mall mix. 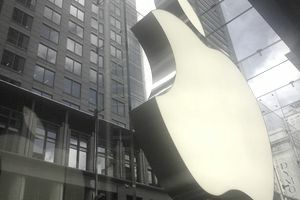 Several New England Apple Stores account for as much as 33 percent of the total sales for the malls in which they do business. Reportedly, more than 1 million customers visit Apple stores each day worldwide, which is more than double the attendance at all the Disney Theme Parks around the world combined. The busiest Apple Store in the world is the Nanjing East store in Shanghai, which attracts about 25,000 customers per day. The biggest in the world is in Amsterdam, clocking in at 27,000 square feet, with an 82-foot long Genius Bar.